Ing articulung iti tungkul ya keng the modern French region of Limousin. 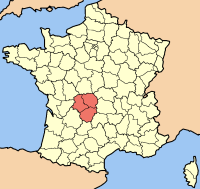 Para the historical province and cultural area of Limousin, lawen ye ing Limousin (province). Ing Limousin (Occitan: Lemosin) metung ya kareng 26 a labuad ning France. (Frances) Limousin regional council website, with a presentation video in English. Tauli yang miyalilan ining bulung anyang 23:16, 8 Marsu 2013.